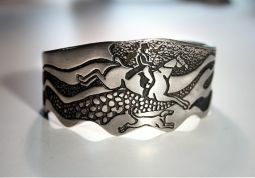 Horse Lover's cuff bracelet with two lovely sculptural horses on a heart background. Adjustable mirror polished pewter cuff fits wrists of 5 1/2 to 8 inches around. 1 3/4 inch at the widest tapering to 3/4 inch on either side. 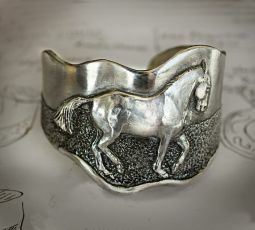 All pieces handmade from design to finish by the Artist, Cindy Hughes. 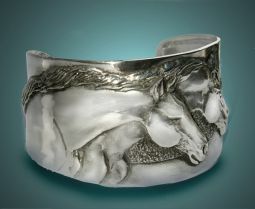 Highest quality Pure Pewter, made here in her home in the USA.